I arrived back in camp yesterday after a splendid 7 days holiday in London and Brighton. I only spent two nights in London going and returning from Brighton. I spent each evening at the theatre. I saw the Revue "Zig-Zag" it was a wonderful gorgeous affair. As I was walking along the Strand last Saturday I saw Lance Corporal Tai Heketa - you will remember him. he came over and sang for us at Harrow week. He is now in prison in London pending trial. 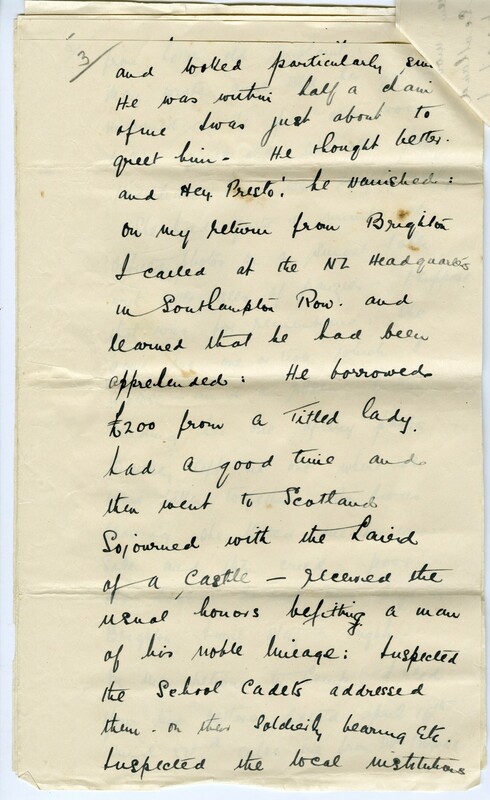 He is one of the cleverest adventurers who has been moving about England and Scotland during the war. At present I have not got the full facts of his remarkable doings. I am only repeating what an Anzac policeman told me. Later I will narrate you the story of the "Duke Carr of Kyama" - Lance Corporal Heketa's nom de plume. For some time past the military and civil police have been searching for him - The Duke has a lot to answer. The most serious charge will undoubtedly be desertion and gulling (?) the public for over £1000 besides a score of minor charges. When I saw him in the Strand he was dressed as a captain and looked particularly sad. He was within half a damn of me I was just about to greet him. He thought better and Hey Presto, he vanished: On my return from Brighton I called at the NZ Headquarters in Southampton Row and learned that he had been apprehended. He borrowed £200 from a Titled lady, had a good time and then went to Scotland Sojourned with the Laird of a Castle - pleasured the usual honors befitting a man of his noble lineage: suspected the School Cadets addressed them on their soldierly learning etc. Suspected the local institutions from [illegible] old complaint. 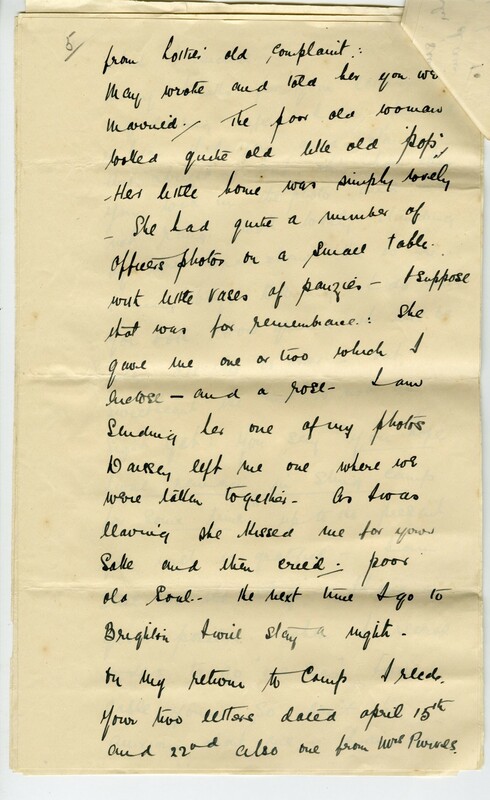 May wrote and told her you were married. The poor old woman looked quite old like old 'pop'. - She had quite a number of officers photos on a small table with little vases of pansies - I suppose that was for remembrance: She gave me one or two which I enclose - and a rose - I am sending her one of my photos. Waissley left me one where we were taken together - As I was leaving she kissed me for your sake and then cried. Poor old soul. The next time I go to Brighton I will stay a night. On my return to Camp, I read your two letters dated April 15th and 22nd. Also one from Mrs [illegible], which I enclose. Many thanks for your letters my darling wife. I am pleased to hear that you and Rangi are alright - but oh! how thin you look in the photo and does not Rangi look lovely standing by Mrs Bradshaw. He is a bonny boy. Darling I do miss you both. How grand it will be when all this is over, but sweetheart the end is not in sight yet: You say, "you hope I will remain in Sling for some time" up to the present your wish is gratified - I am still on the Staff - I have a good position. When I receive orders to go "over-seas" I will cable you - so don't be anxious about me. I am very well and getting on "tip top" / my thoughts sweetheart are always with you, for your sake and dear little Rangis I will take the greatest care of myself. I am looking after myself and leading a good clean life. I am darling if you were with me you would be quite pleased. 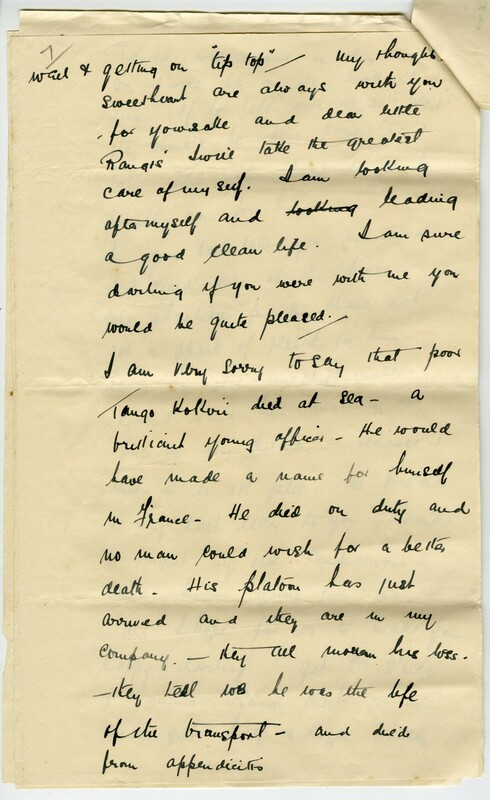 I am very sorry to say that poor [illegible] died at sea - a brilliant young officer - he would have made a name for himself in France. He died on duty and no man could wish for a better death. His platoon has just arrived and they are in my Company - they all mourn his loss. The tell me he was the life of the transport and died from appendicitis. George will arrive in this Camp so I will be on the look out for him - if he left with the 25th Regiment, they should be here some time in July. Tell mother I will do all I possibly can for him. In your last letter you mentioned that 'Dad' was at the house - to be absolutely frank I have not got a spark of respect for him - he is an old mischief maker. I don't want him making a fuss of my children - because I know it is all false. 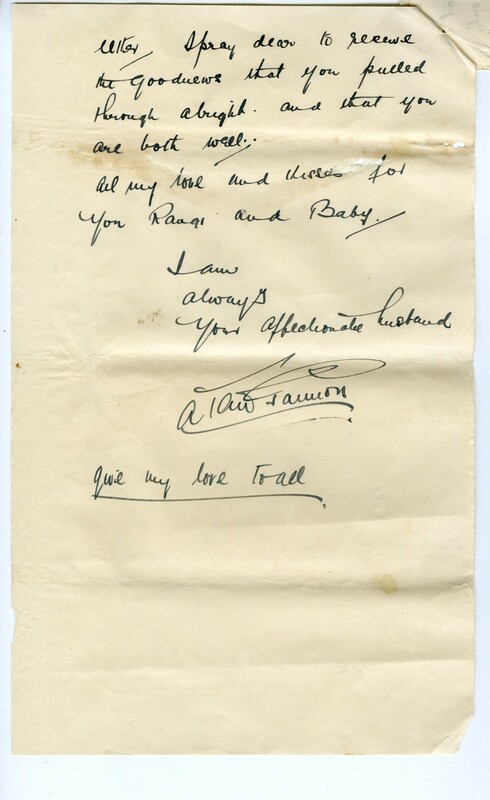 As I said in my last letter to you I want to forget my old companion and I am going to too. All I hope for it to make you happy darling. Get Dr Stride to examine Rangi['s] chest at once and get half a dozen bottles of Scotch emulsion. Do look after him Edna please. It would be [illegible] if any thing happened to him. 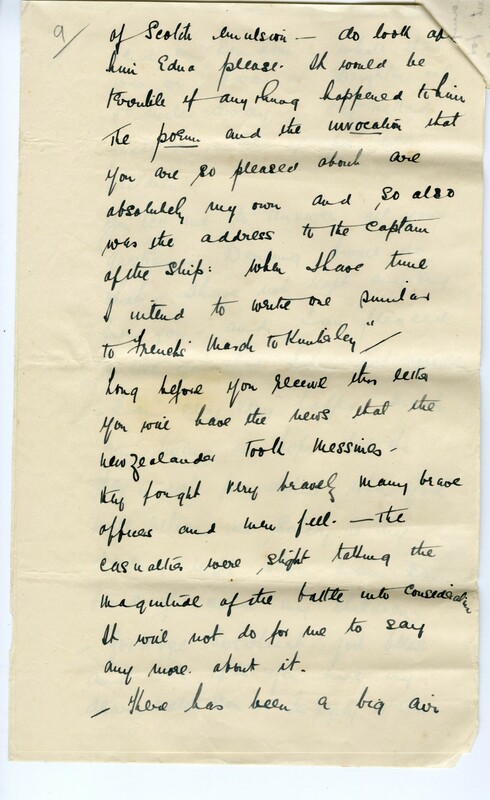 The poem that you are so pleased about are absolutely my own and so also was the address to the Captain of the Ship: When I have time I intend to write one similar to "Friends March to [illegible]." 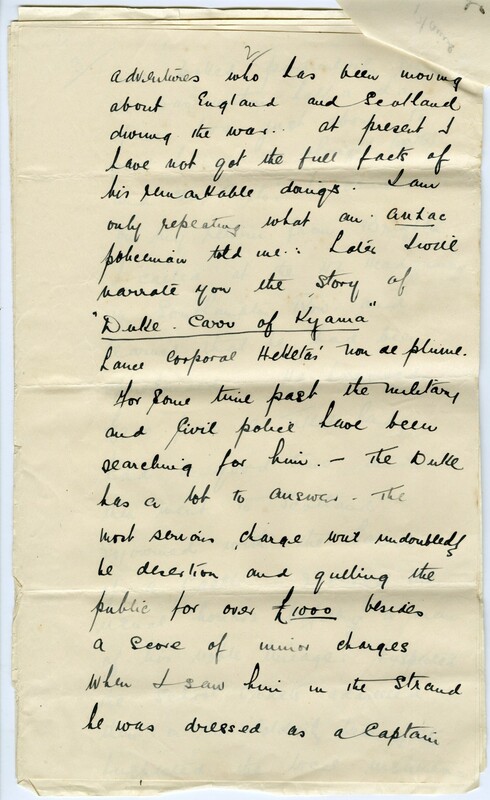 Long before you receive this letter, you will have the news that New Zealand took Messines. They fought very bravely, many brave officers and men fell. The casualties were slight taking the magnitude of the battle into consideration. It will not do for me to say any more about it. There has been a big letter. I pray to receive good news that you pulled through alright and that you are both well. All my love and kisses for you, Rangi and Baby. RNZA Historian/Engineer Corps Memorial Museum Curator Howard E Chamberlain provided materials from the Gannon Family Archives from his private collection.